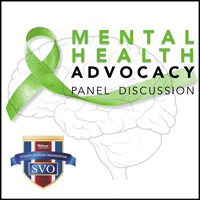 The Webster University Student Veterans Organization (SVO) will sponsor a Mental Health Advocacy Panel Discussion on Wednesday, March 21, at 5:30 p.m. in Browning Hall Auditorium. Students, staff, faculty and community members working in mental health, those passionate about mental health promotion, or others impacted by this issue are encouraged to attend. This event is free and open to the public. The panel event will be made available to extended campus locations via live stream. The panel aims to empower students, veterans and community members to take part in fighting the stigma surrounding mental illness, gain skills to identify signs of depression or suicidal thoughts, and provide tools and resources in the event of a crisis. In hosting this panel, the Webster SVO partners with Washington University, Lindenwood University and UMSL student veterans in support of Missouri Veterans Endeavor’s "Student Veterans Week" events in the St. Louis area March 17-24. Veterans, family, and community members are invited to attend all MOVE Student Veterans Week events. About Missouri Veterans Endeavor - Missouri Veterans Endeavor (MOVE) is a community for homeless veterans and their families. The key to MOVE’s success begins with veterans living among their peers in a secure and sober environment with on-site counseling services available 24/7. Once on site, each family member is assigned an individual caseworker. Together they create and implement a well-defined personal action plan to address their specific obstacles and goals.